A medicine cabinet must. A pre-blended oil which can be used in many different ways to help soothe blemished skin. Dab directly onto skin at first sign of a blemish. For blemishes, apply a small amount directly onto blemishes using a clean cotton wool bud or your fingertip. For bathing, add six drops into the bath once it has run, and disperse with your hand, for an aromatic and soothing soak. For facial steaming. Before using the Tea Tree Oil on blemishes, cleanse first using Tea Tree Cleansing Wipes or Tea Tree Skin Clearing Foaming Cleanser. Complete your daily regime with Tea Tree Skin Clearing Toner and Tea Tree Skin Clearing Lotion. Water, Alcohol Denat, PEG-40 Hydrogenated Castor Oil, Polysorbate 20, Melaleuca Alternifolia (Tea Tree) Leaf Oil, Limonene, t-Butyl Alcohol, Calophyllum Inophyllum Seed Oil, Citral, Leptospermum Petersonii (Lemon Tea Tree) Oil, Denatonium Benzoate, Tocopherol. This Body Shop Tea Tree Oil is good for people prone to spots/blemishes like myself and when using the oil it takes time for spots/blemishes to reduce, i use it anytime and i apply it using my finger tips directly onto a spot that's growing. I love tree tea because it is a good brand and i mostly buy products that help with clearing up/reducing my blemishes or spots. This is great. I use this product every night on blemishes and I am beginning to see a difference. This packaging is very easy to use due to the non leaking lid. Not really any apart from the fact that it will take a while to get rid of blemishes. I have used this for many reasons, to make spots less angry red, clear up spots, on toes when nails are brittle, cold sores. Always read the label when using essential oils. 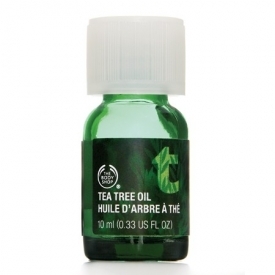 Have bought tea tree elsewhere a lot cheaper but if you need it fast, this stuff works fine.